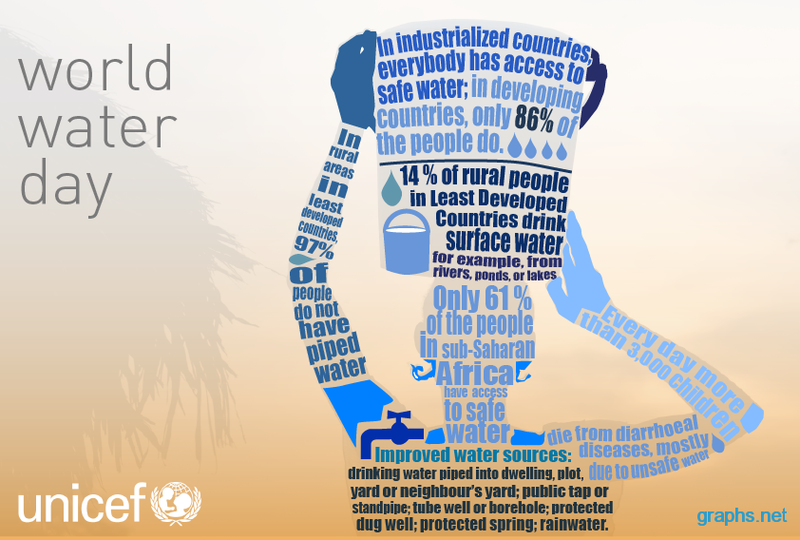 World Water Day takes first set up in 1993 and since then it is celebrated on 22 March every year. It was set up in order to raise awareness of the global water crisis. We waste many things in our everyday life, including food, money, energy, time and even water, although more than two billion of the world population live without access to clean water. Water is also important for adequate hygiene and sanitation something that approximately 2.4 million people lack. Water is a vital resource that we need to protect. It can be also a source of global problems. We have to deal with wastewater. Adequate sanitations and clean water for every person improve their quality of life. We can reuse some of our wastewater for non-potable household needs such as flushing toilets, watering the garden etc. Agriculture is a big user of water and there is an increasing use of waste water, especially in irrigation which reduces water consumption. In the case of industries, recycling waste water reduces the release untreated wastewater, into the surrounding rivers and water courses. As a result protecting the environment and the local ecosystem. The reuse of waste waters can bring huge benefits to the environment preserving it for the next generations. The future depends on what we do today to our water and our waste water.